InfoSAWIT, PALEMBANG – The government through PT Pertamina (Persero) is now developing environmental fuel. According to Minister of Energy and Mineral Resource, Ignasius Jonan, it is the obligation to develop environmental fuel as the part of world civilization and as citizen of Indonesia. “If Indonesia gets 5% economic progress, and if it does not start to use environmental fuel, in the next 25 years, there would be worse pollution,” he said in the Kompleks Kilang Plaju, Palembang through the official statement to InfoSAWIT. He also hoped that besides producing environmental fuel, it should be deriving from renewable energy. “By hoping that the diesel fuel that PT Pertamina produced derives from renewable energy so there would be less air pollution,” he said. Director of PT Pertamina (Persero), Nicke Widyawati said, PT Pertamina is developing environmental fuel from palm oil. Besides implementing it by blending FAME, it implements the co-processing and hydrorefining. "Co-processing and hydrorefining would produce cleaner energy if compared with it using FAME. 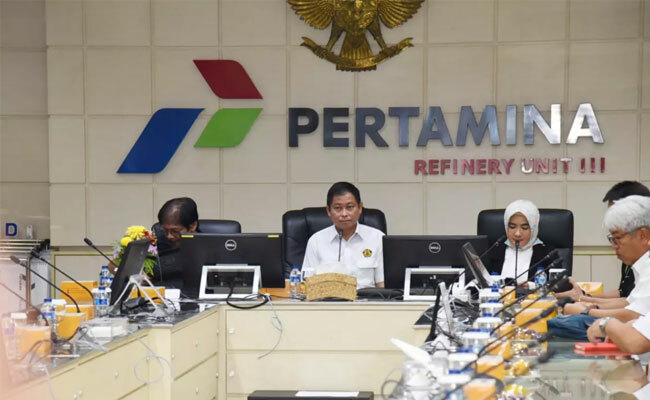 The options to develop clean energy by hydrorefining process are the ideas of the youths of this nation in cooperation with LAPI-ITB within the catalyst name, katalis Merah-Putih," she said. Nicke also mentioned that developing environmental fuel is in phase to do in some factories of PT Pertamina and it is hoped that before 2023 the process could be implemented in four factories of PT Pertamina that have Residual Fuel Catalytic Cracking (RFCC) to produce green diesel, green avtur, and green fuel.